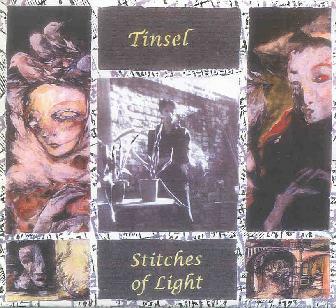 Tinsel - "Stitches Of Light"
Stitches of Light is a thirty-three minute morceau, saturated with hidden attics, aimless walks, shadowy rooms, dusty books, and abandoned gardens. Tinsel, AKA Michael Hopkins, is a New Orleans based one-man combo. Stitches of Light, the new mini album, is the follow up to The Lead Shoes CD on (Keyhole/Broken Face). The music of Tinsel is nice, spooky, atmospheric, with the pleasant female vocals of Kaleen Enke and Leasle Chalim, along with avant garde kooky New Orleans chirpy music that sounds like ants marching through your nightmare. It was early February and I had just arrived. Somehow reminds me of the Cocteau Twins even though I only listened to the Cocteau Twins once when I was being driven around town by some weird drunk girl in 1985, but I made a mental note to listen to some... which I never did. The gravel of the winding road was long gone and what remained was probably more suitable for a tractor than for a car I'd been driving. In places it sounds like a Paxil commercial. There are girl/boy vocals, sparse drum machines, cool effected out backwards stuff, overall very pleasant and well done. I was about to seek out the imaginary home of Tinsel and the sight right in front of me offered a visual description more precise than I ever could have dreamt of. Reminds me of when I stayed in an old bed and breakfast in the Garden District of New Orleans that had formerly been the slave quarters... there's lots of ghosts in New Orleans and Tinsel has managed to capture them on tape. If I turned my head slightly to the right I could see an old homestead. Sonnam (Sweet Light in a Dark Room) is the hit, opens with dramatic keyboard, female vocal, On a strange night I saw the sweet light. I appreciate the mix of experimental with pop, very effectively done. Good music for getting up on Sunday morning and sitting on the couch and wafting away in the sweet smoke. For more information you can email Keyhole Records at: clavis_sub_rosa@hotmail.com. Contact via snail mail c/o Keyhole; 1310 Governor Nicholls; New Orleans, LA 70116.